A cold air inversion remains of the Front Range of Colorado but the foothills just west of Boulder have risen above the cloud layer. 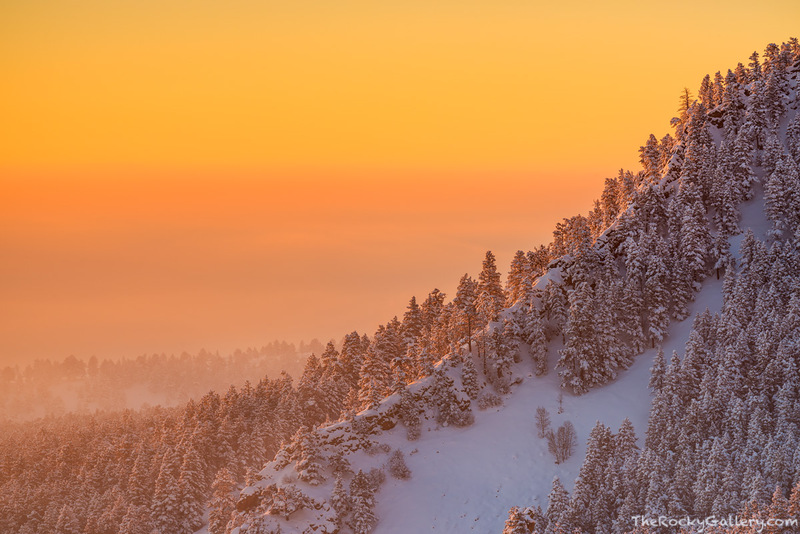 A February snow storm has covered the evergreens with fresh snow and as the sun rises over the high plains of Colorado, the orange warmth of the sunrise colors the skies. In this view we are looking south from Flagstaff Mountain at the side of Boulder famous Flatiron formation. Denver is and it's suburbs are located south of the Flatirons in this image but are blanketed by the low hanging inversion layer and clouds. Photo © copyright by Thomas Mangan.